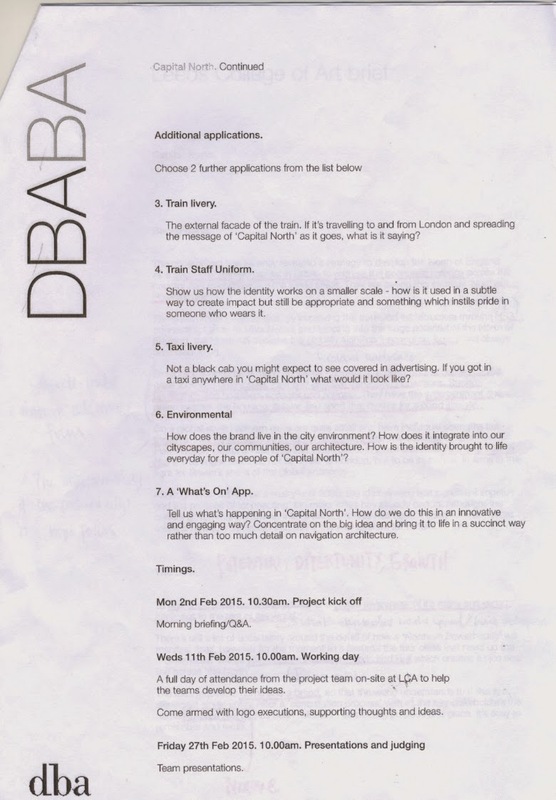 After the preliminary briefing with the designers from DBA had concluded the first task that needed completing before progressing with the project was selecting a group of people to work with. Initially, just after the briefing had finished I was approached by Sean asking if I wanted to start a group with him. After agreeing we went round the class asking additional people if they wanted to join us. Despite having gone through the brief with the DBM members, we decided that it would be beneficial to read back over the information, a task which had two main benefits. 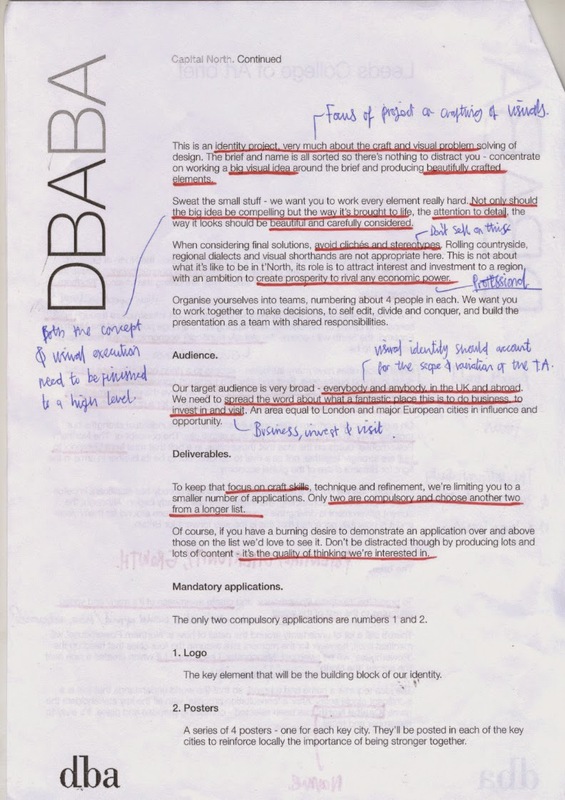 Firstly, reading back through the brief allowed us to review the information again and remind ourselves of the specific aspects of the project. 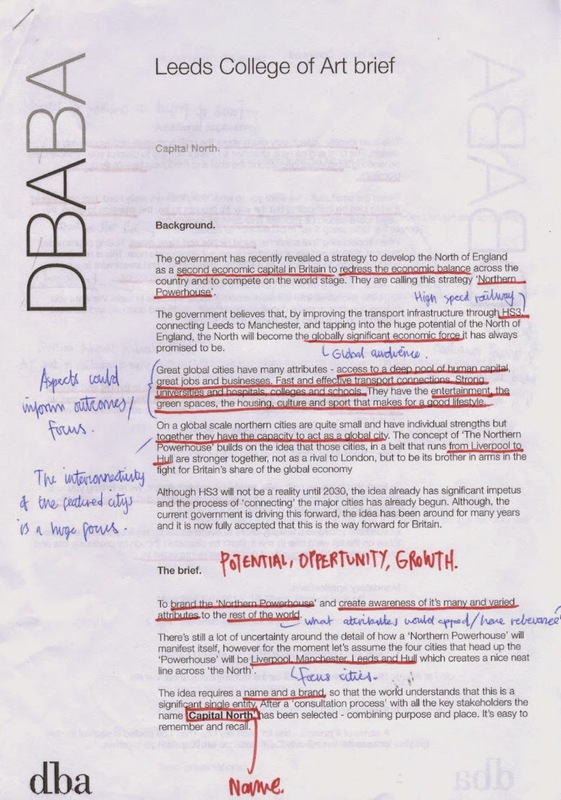 Secondly, while reading back through the content, we were able to outline, highlight and analyse definitive aspects of the brief, a process which is essential to creating an informed, original outcome. The 'HS3' high speed railway will connect four main norther cities to London - Visuals could be built around this and the idea of connection/unity. Outcome need to communicate to a global audience - Communication need to be simple and effective. City attributes - Access to human capital, great jobs & businesses, effective transport, strong universities, schools, colleges and hospitals, entertainment, green spaces, range of housing and accommodation and vibrant culture. The interconnectivity shared between the four cities should be a main focus of the campaign. Potential, Growth, Opportunity - Brand Values. Liverpool, Manchester, Leeds & Hull - Featured cities. Capital North - Brand name. Focus of the project should be on the quality and effectiveness of the visuals. Reasons for audience to visit listed cities - Business, Invest, Visit. What the are looking for - Quality thinking & Well executed visuals. After going through the brief we decided to progress with the project by collecting some quick secondary research to help create a base knowledge of the cities listed in the brief. 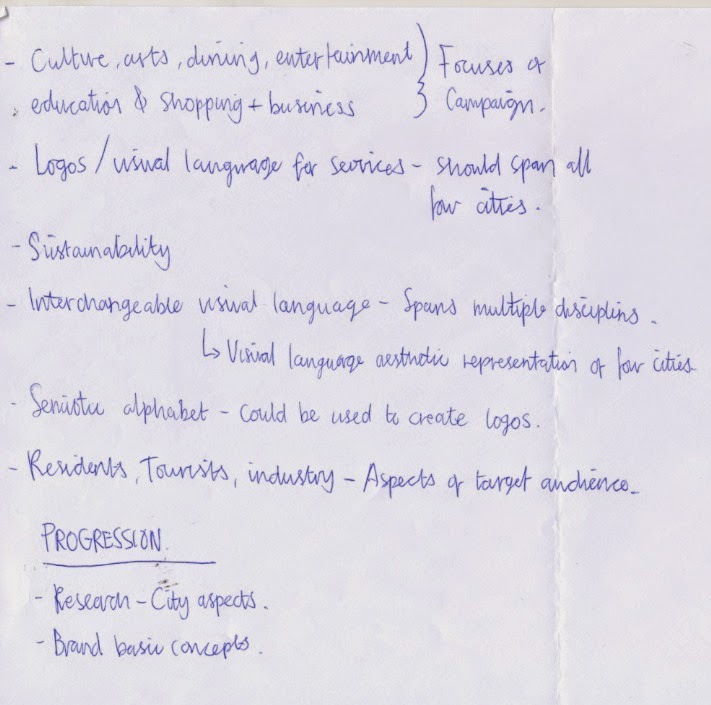 After each group member had been assigned a city we gave ourselves 20 minutes to collect a body of research into the three reasons people would want to engage with the campaign, to do business, to visit or to Invest. Not only did the quick exercise broaden our knowledge of the feature cities, it also allowed us to assess if there are any common factors shared between the cities that could subsequently help to form an initial concept. I researched into the city of Leeds. Information gathered from the exercise is displayed below. After the 20 minutes were up each member of the group talked through the information they had found. During this process, we discussed similarities and aspects that could potentially featured in the campaign. Manufacturing is huge up north, Leeds and Manchester have some of the largest employment bases of anywhere in the UK. 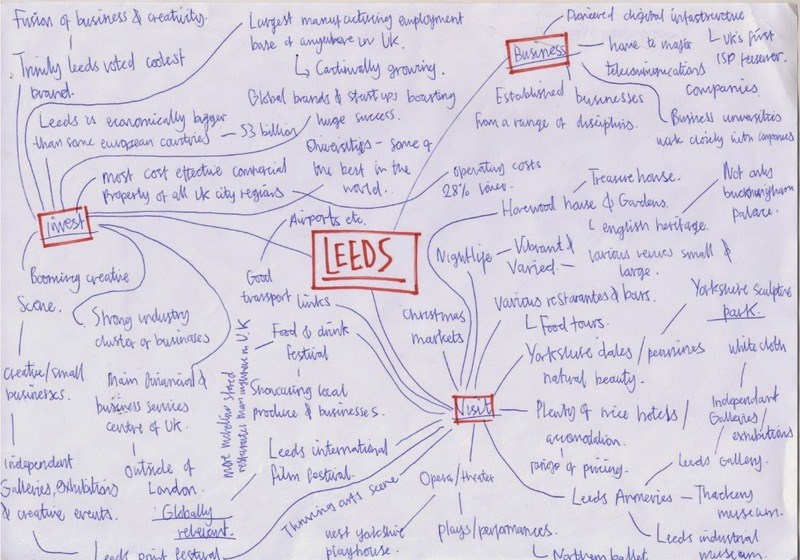 Global brands and start-up companies boast huge successes in the north. The north boasts some of the most cost effective commercial property of all the UK regions. Operating costs are 28% lower in norther regions. There are a range of reasons to visit the northern cities, from tourist attractions like museums and galleries to beautiful countryside destinations like the Yorkshire dales. During the discussions I took down notes as I found multiple ideas and directions were inspired as the information that was presented. Focuses of campaign - Culture, Arts, Dining, Entertainment, Education, Shopping & Business. A visual language of semiotic symbols could be created for the four cities. Symbols would have relevant to definitive aspects of each city. A visual language would surpass the communication barrier encountered when addressing a global audience. The visual language could be used to create a logo/logos. The audience could be focused into three main categories defined by the reason people visit cities - Residents, Tourists, Industry. After completing the various exercises and discussing their outcomes we decided as a group that although there are some rough ideas emerging it would be beneficial to collect further, focused research before starting to develop a concept for the project. Each member of the group was assigned the same city they researched into during the initial task, with the undertaking of collecting an additional body of secondary research.